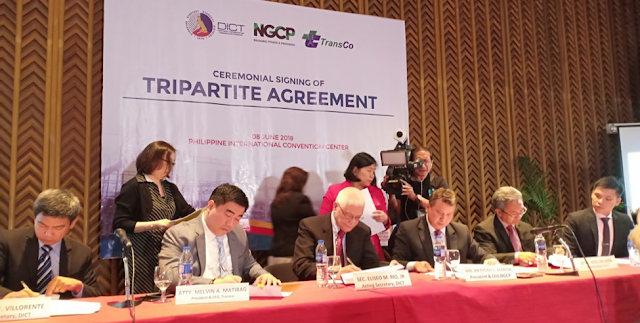 The Department of Communication and Telecommunications (DICT), National Grid Corporation of the Philippines (NGCP) and National Transmission Corporation (TransCo) signed last Friday, June 8 a Memorandum of Agreement that will make internet speed faster at no charge in selected public places nationwide. From L-R: DICT Usec. Denis Villorente, TransCo President Atty. Melvin Matibag, DICT Acting Sec. Eliseo Rio, NGCP President Anthony Almeda, TransCo General Counsel Atty. Noel de Leon, and NGCP Chief Admin Officer, Atty. Bryan Co. The National Transmission Corporation (TransCo) said that fast and free internet is in sight following the signing of the Memorandum of Agreement among DICT, NGCP and TransCo on the National Broadband Project. TransCo President Atty. Melvin Matibag the country is well on the road to accomplishing the promise of President Duterte in his first State of the Nation Address (SONA) to give fast internet speed at no charge in selected public places including parks, plazas, public libraries, schools, government offices, hospitals, train stations, airports and seaports nationwide. “This is major milestone. We are very happy that this MOA was finally signed. This will also help hasten the processing of licenses, permits, clearances and other government issuances nationwide,” Matibag added. Matibag also congratulated DICT Acting Secretary Rio for DICT’s major accomplishment. President Matibag gave special thanks to NGCP President Anthony Almeda for allowing the free use of the dark fiber in the transmission lines for the use of government.